A parliamentary report of 1777 recorded a parish workhouse in operation at Brandon with accommodation for up to 22 inmates. The building was located on Church End, near the parish church, and dated from 1778 although may have incorporated parts of an earlier structure. In 1843, the former workhouse was converted for use as the Victoria National School. Northwold had a parish workhouse in operation in 1787 when it is mentioned in a census of that year. At Thetford I found the poor farmed at three shillings per head, per week, clothing included. The keeper is a wool-comber. The house is old; the beds and bedding, and rooms, very clean, and well-ventilated; all the children had shoes and stockings on, their hands, face, and necks clean and dome attention had been paid to their education, but they were too young, and had been there too short a time to make much progress. County of Norfolk: Brettenham, Cranwich, Croxton, Feltwell St Mary and St Nicholas (2), Hockwold with Wilton, Kilverstone, Lynford, Methwold (2), Mundford, Northwold (2), Rushford, Santon, Sturston, Thetford St Cuthbert (2), Thetford St Mary (2), Thetford St Peter (2), West Tofts, Weeting-with-Broomhill [Bromehill], East Wretham, West Wretham. County of Suffolk: Barham, Barningham, Brandon (4), Coney Weston, Euston, Fakenham Magna, Hepworth, Honington, Hopton, Kentishall, Market Weston, Santon Downham, Sapiston, Thelnetham. Later Additions (from 1902 unless indicated): Blo Norton, Bridgham, East Harling, West Harling, Feltwell Anchor (from 1858), Garboldisham, Gasthorpe, North Lopham, South Lopham, Redmere (1837-65), Riddlesworth, Rymer (from c.1836), Great and Little Snarehill (from 1858). The population falling within the Union at the 1831 census had been 16,198 with parishes ranging in size from Santon (population 18) to Brandon (2,065) and Thetford itself (3,462 combined total). The average annual poor-rate expenditure for the period 1833-35 had been £9,850 or 12s.2d. per head of the population. 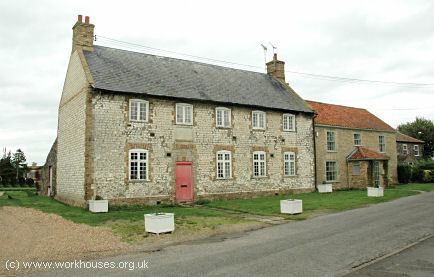 A new Thetford Union workhouse was erected in 1836-7 at a site to the south of Thetford. It cost £5,375 and could accommodate up to 300 inmates. The building was designed by William Thorold who was also the architect of workhouses for the Depwade, Guiltcross, and Walsingham Unions. His design for Thetford was based on Sampson Kempthorne's model "square" plan published by the Poor Law Commissioners in 1835. The entrance range at the south contained the porter's lodge, board-room, offices and so on. To the rear, radiating from the central supervisory hub, were four accommodation wings for the various classes of inmate (male/female, old/able-bodied etc.). The areas between the wings formed segregated exercise yards. Service and workshop buildings formed the square perimeter of the workhouse. The site location and layout are shown on the 1905 map below. In 1894, the British Medical Journal set up a "commission" to investigate conditions in provincial workhouses and their infirmaries. Following a visit to Thetford, the commission's report noted several matters which required improvement. The only nurse employed at the workhouse was an untrained former inmate. No night nurse was provided. Most of the nursing work appeared to be carried out by pauper inmates. Further details are available in the full report. 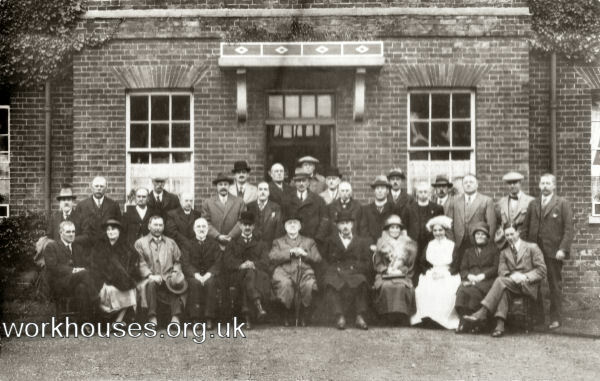 Minister of Health, Neville Chamberlain, visits Thetford workhouse, 1920s. The former workhouse site has now been completely redeveloped. The Thetford Union operated a children's cottage home at 23 Old Market Street, Thetford. In 1924, it could accommodate 14 children who were in the care of the superintendent E.S. Hansell. The property is now a private residence. Norfolk Record Office, The Archive Centre, Martineau Lane, Norwich NR1 2DQ. Relatively few local records survive. Holdings include: Guardians' minute books (1835-1930); Ledgers (1836-1930); Service registers (1854-1925); etc.